Today festivals have been reduced to marketing calendars dotted with ‘Sale’ seasons and ‘Big Discount Days’. While I do think that we know of more local and regional festivals today than ever before, like say for example, Varalaxmi Puja, Akhsay Trithiya, Vishwakarma Puja, Teej and Karwa Chauths etc. over and above the regular Ganesh Chaturthi, Christmas, Id-Ul-Fitr, Janmashtami simply because these are bumper days in the kitty of a marketing head. But how much of our festivals and their importance do we really know? How much of it do we actually know enough to pass on to our kids? 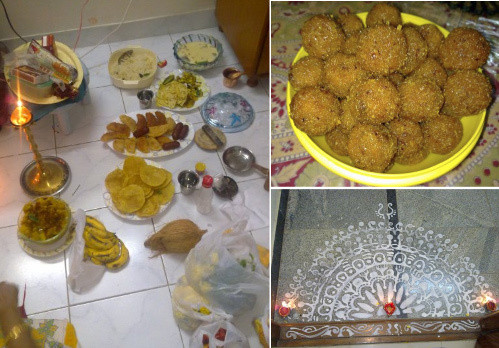 A decade or two ago, when we were growing up, our parents celebrated all these festivals and more. There were really small miniscule festivals that not necessarily demanded a big fanfare. Festivals that were about celebrating together, getting together, preparing some very peculiar customary cuisines and narrating the stories, tales or parables that described and explained the true essence of the festivals. Pretty much all of us lived in joint families or extended families or at least lived in proximity to each other. Early mornings would bring about a customary bath, a special puja, the kitchen wafting with aromas of delicacies that got made only once or twice a year, families and friends coming over, homes being all spruced up and dressed up with fresh flowers, conch shells and incense sticks and homes all abuzz with a frenzy of activities that you wouldn’t see on a regular day. There were no ‘Sales’, no ‘Big Discounts’, no over-the-top bazaars that shrieked out to us of what and how you should dress for the occasion which usually looks similar for all occasions and there is nothing peculiar and rustic about the events anymore. I am not trying to paint a grim picture, but the truth of the matter is that most of us do not necessary know of the rituals and procedures that made up the festive moods of the festivals in those days. I feel sad. I am not harping on getting all ritualistic or anything. But when I look at myself today I know there has been an erosion of knowledge over the generations and I know my daughter will hardly be an heir to much of it. I am a Bengali and my grandmother knew the tales of a lot of Shashti pujas (these are pujas almost every other month followed by married women in Bengali homes for the good health of their children, but each with a different cuisine, ritual and story) by heart. My mother knows how to read Bengali and was able to read the almanac and also got her way through the tales of various pujas and knew quite a lot. But I for one, can hardly read my language (it takes me an hour to read a page and I am not proud of it) and that itself is one of the biggest reasons that I know less of my own customs and festivals. With me staying away from home and far away in a different province only adds to that handicap. So sometimes I do not know when or why certain festivals are to be celebrated. I feel sad for my daughter as I know she will know even lesser because I am not in a position to enlighten her. With most of us living in nuclear families in different provinces other than our home towns, we are getting more and more distant from what I’d say was the fabric of our very culture. Thankfully for me, I live in a cosmopolitan society and we all take a huge effort to try and celebrate festivals, big and small. We try to find the common reason or common rituals for a particular festival and we celebrate it. Make a big deal about it. Dress up our kids, dress up our homes, hunt for our Amar Chitra Kathas to search for the stories, look up the internet and try to re-create the magic. We do not make it very flashy. We try to keep it earthy. Just the way it was when we were little. It’s been fun so far. Knowledgeable too. As we get more and more busy, families getting smaller with single kids and no siblings, festivals being made to look like the marketer’s guide to the shopping bag, we need to internalize, reflect and recreate the magic of growing up in innocent times. Strengthen their imaginations. Let them write their own songs. Let them dance to instrumental music rather than on film songs always. Share our cultural and local foods and let’s celebrate the big and small of every festival. Let’s fill our children’s lives with the stories of yore and trust me, it will be fun. My friends and I are trying for sure.